It was a wild trail run at Mount Van Hoevenberg yesterday. I was reminded to pay attention to the trail in front of me instead of constructing sentences in my head when I nearly ran over a mother grouse. She wasn't distracted however and emphatically announced her presence. Hidden in the weeds until I came within a couple of feet and earshot of her, she literally blew up at me. With a shriek, she exploded out of the weeds and ran directly at me. Her feathers fluffed out, she struck an effectively mean and menacing pose. Somehow, she even managed to make her beak appear razor sharp; the better to poke out my eyes. As I came to a quick stop, the nearby chirping of baby grouse told me I was suffering the wrath of momma grouse for getting too close to her chicks. After staring at each other for a few moments, I sheepishly realized I was in a standoff with a creature 1/60th the size of me. Meanwhile the deer flies were taking advantage of the situation, savagely biting me, a still and easy target. The swarming bugs pushed me over the edge, so I finally bucked up and yelled back at her (Yeah!) and pretended I wasn't afraid to run right by her. Not easily dissuaded, she pulled the "Look, I've got a broken wing...." shtick, and hobbled off in the opposite direction from her chicks, hoping I would follow. Since I am not crazy like a fox, I chose not to pursue her and high-tailed it out of the grouse nursery. 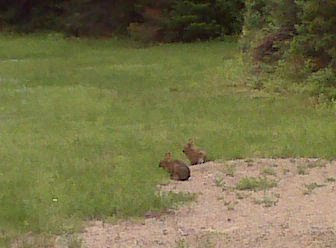 As a result of that wildlife interaction, I was paying strict attention later in the run when I encountered two bunnies, having a moment together. "How sweet," I thought as I fumbled with the cell phone camera and snapped today's featured photo. We all stood quietly and calmly enjoying the day, and they eventually hopped calmly off into the thicket. As I started to put the cell phone away and formulated the thought how this calm scene was a welcome change from the earlier aggression, a gangling young hare bounded out of the brush. Despite the fact that I was standing stock still in a rather wide section of trail at this point in the outing, this relative of the mad hatter nearly ran into me! Naturally, my thoughts went immediately to the Killer Rabbit of Caerbannog from the movie, Monty Python and The Holy Grail. 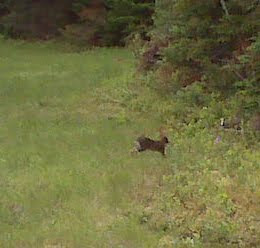 I screamed when I realized the bunny was within striking distance, causing him to stop in mid hop. He looked terrified; like he was having a bunny heart attack. 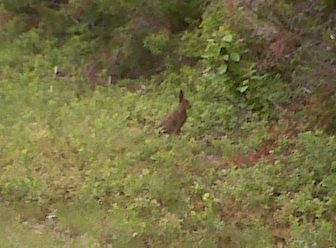 He turned and sprinted into the woods in the direction of the hare couple who had just left the area. Before I could calm my racing heart, all three animals came hopping and leaping out of the brush, making odd grunting sounds. Thankfully, they ignored me and proceeded to jump over and bump into each other, clearly very excited about something. The lanky, single hare appeared to be chasing the other two. All three creatures proceeded to jump and run in and out of the thicket to either side of the trail, completely oblivious to my presence. This went on for several minutes; in and out of the brush, grunting and snorting at each other, fur flying on the normally calm trails at Mount VanHoevenberg. I had stumbled into the middle of a bunny dust up. The resident biologist tells me the scene probably represented an older male hare who was coolly chatting up a female when I first encountered the pair. 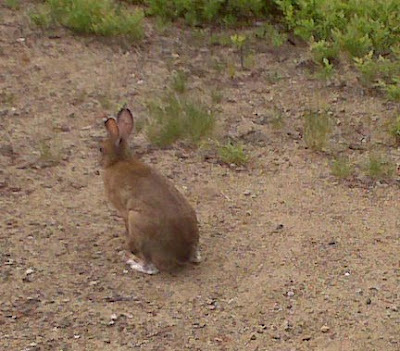 The skinny hare was most likely a teenage male, looking to get in on the action. Springtime hormones, teenagers creating a ruckus, and males in a tizzy over a female - some things never change! "Constructing sentences in my head" ... I can totally relate. I do it skiing, riding whatever. Bloggeritis.